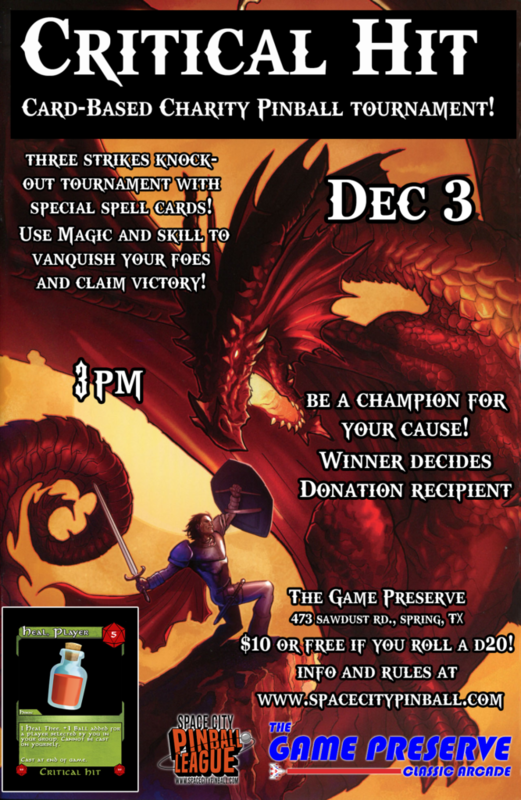 Critical Hit Houston: Charity Pinball Tournament! December 3. The Space City Pinball League will be hosting a “Critical Hit” charity pinball tournament on Saturday December 3 at The Game Preserve! Darkness. Play entire game with score displays covered. Forbiddance. Swap a specific player from your group with a random player from a different group. There are 20 different cards in total. All players with a world ranking between 1-250 will receive one random card at the beginning. All other players will receive two random cards. It costs $10 to enter the tournament. Additional donations are encouraged. Players placed into random groups of 4 (sometimes 3). The top two players after each game will earn a random spell card. Upon the conclusion of Phase 1, any remaining spell cards will be auctioned off with 100% of the proceeds going to the charity pool. Games and positions will be randomly assigned during this phase. New players can join any time during this phase. Phase 2: 3-Strikes – 6pm. Players placed into random groups of 4 (sometimes 3). The bottom two players after each game will receive a strike. In the case of a 3 player group, only the 3rd place player will receive a strike. Players are eliminated from the tournament once they receive 3 strikes. Houston Area Women’s Center. Ending sexual and domestic violence. Houston Food Bank. Filling pantries, filling lives. Houston Habitat for Humanity. Building homes, community, and hope. Can’t make it to the tournament but still want to contribute? Contact Phil at phil@spacecitypinball.com. Special Thanks to Karl DeAngelo, who created the “Critical Hit” concept, format, and playing cards. 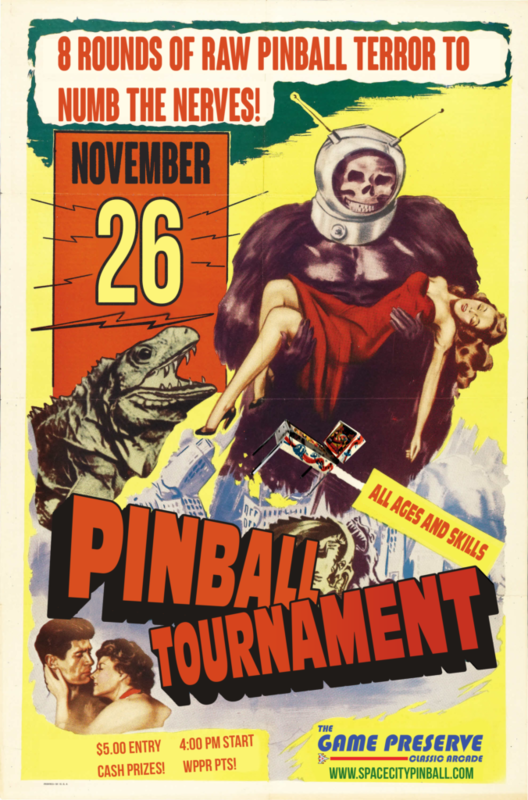 Join the Space City Pinball League on November 26 for an afternoon of friendly pinball competition! Players of all ages and skills are welcome. It costs $5.00 to enter, and entry fees are paid out in cash prizes. Registration at 3:30 PM. Up to 8 rounds of group match play from 4pm-7pm. Top 16 players qualify for finals at 8pm.